The Russian Defense Ministry said on Monday that Russian naval warships and coastal troops conducted live fire exercises in the country’s western Kaliningrad Region. The exercises, part of a combat readiness test ordered by President Vladimir Putin last week, come amid a growing international crisis as evidence mounts that Russian troops have been deployed across Ukraine’s Crimea peninsula. 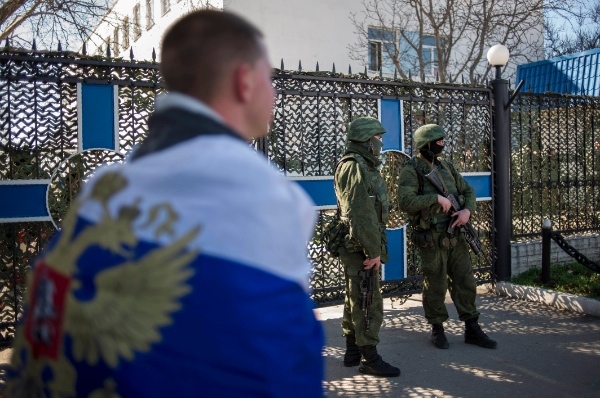 Western nations have simmered over the deployment of Russian troops in Crimea. British Foreign Secretary William Hague on Monday warned Russia’s membership of the G8 could be under threat. “The world cannot just say it is OK, in effect, to violate the sovereignty of another nation in this way,” he told BBC in an interview. US Secretary of State John Kerry had said Sunday that the US was prepared to economically isolate Russia, while promising financial support for the new Ukrainian government, made up of an erstwhile opposition that ousted President Viktor Yanukovych. A spokesman for Russia’s Western Military District, which borders Ukraine, said that a broad range of weapons systems, including ground troops, tanks, and naval artillery and air defense missiles, took part in the Baltic Fleet exercises. The Baltic Fleet units engaged dummy air, sea and land targets simulating enemy forces, including tanks, aircraft and submarines. Russian Defense Minister Sergei Shoigu earlier said the snap inspections of more than 150,000 troops of western and northern military units were not connected with events in Ukraine. The drills were scheduled to end Monday. Meanwhile, on Monday, Russian Foreign Minister Sergei Lavrov said in a speech to the UN Council on Human Rights in Geneva that the decision to dispatch Russian troops to Crimea was a measure aimed at protecting human rights and Russian citizens. “I reiterate, we are talking about protecting our citizens and compatriots, about protecting the most fundamental human right — the right to live and nothing more,” he said. Russian Prime Minister Dmitry Medvedev also signed an order Monday to construct a bridge linking Russia to the Crimean peninsula. The bridge would span the 4.5-kilometer Strait of Kerch, which separates Ukraine and Russia, an estimated $3 billion project that has been under discussion for a decade. Moscow has held back the $15 billion in financial aid to Ukraine announced earlier, saying it first needs to understand who is in control of the Kiev government.